October 1st is the start of Domestic Violence Awareness Month. Some may ask why we need a month to raise awareness of domestic violence. We’ve all heard of it, right? Yes… and no. Most people in Saratoga County aren’t aware that domestic violence is the #2 violent crime in our county. Most aren’t aware that domestic violence in the primary cause of family homelessness. And people are continually shocked to learn that domestic violence is a primary cause of homicide in Saratoga County (in fact 100% of homicides from 2010-2013 were due to domestic violence). "[Wellspring’s] services made me realize that although things are rough, you do what’s best for your children and everything works out. DV counseling and shelter saved my life and my children." Many people continue to think of domestic violence as primarily physical abuse. Often a caller to our hotline will start with, “A friend told me to call, but I’m not sure I should be calling you… I’ve never been hit.” In fact, many highly abusive relationships may have little or no physical abuse. However, living each day with psychological abuse, financial control, social isolation, threats and intimidation or sexual victimization can be far more devastating than the black eye we so often see on a poster about domestic violence. 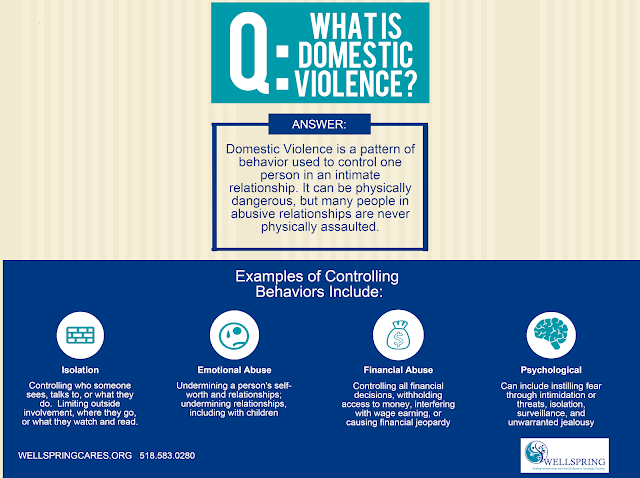 learn more about the various forms of domestic violence. Most people are surprised to hear about the prevalence of domestic violence. During their lifetime, 1 in 4 women and 1 in 7 men are affected by domestic violence. Wellspring's hotline responds to an average of 1,400 calls/year and we assist ~1,000 survivors of abuse each year with free and confidential services ranging from legal advocacy, counseling and crisis intervention, to employment assistance, financial literacy, case management, a Safe Pet program and even a supportive housing program. Sometimes the biggest barriers to leaving abuse involve fears about being able to provide food on the table and a roof overhead for the family. Wellspring helps people overcome these barriers so they can live free from fear… but also have housing and economic stability. [Wellspring] supported me and helped me when I was going through a very tough moment in my life. They were there for me when I needed someone to talk, to advise me how to get help, supporting me during the court days. The staff were also always nice and helpful with my son. They made our stay as easy as possible. They supported us with summer camp for day care when I could not afford it so I could keep working. When someone is living in an abusive home, it can be hard to imagine how to break free. It can be hard to believe that life can be different. Each day we see the courage and strength… and relief… as we work with survivors to create a new future. If you or someone you know has experienced an abusive relationship, you are not alone. Call our hotline at 518.584.8188.